The small Engine House represents part of engine service facilities that may exist at the end of a branch line or in a backwoods or rural area. 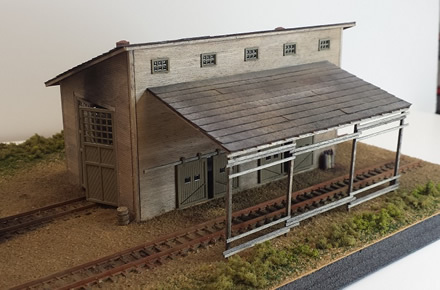 It can fit either a steam- or deisel-era railroad, and offers lots of flexibility to fit your layout. Kit includes: laser-cut wall, roof, floor, & freight doors; Tichy windows & doors; stripwood & roofing; metal detail castings. Acknowledgement: This craftsman kit is adapted to N scale with permission from Carolina Craftsman Kits.